For over a decade, Finnish 15 year olds have consistently featured among the top performers in the OECD Programme for International Assessment (PISA). As a result, the Finnish education system has been at the centre of attention of educators and policy-makers from countries around the world1. (Chung & Tsuruta, 2010; Anders, 2011). While the high quality, status and autonomy of teachers; a consistent education policy that has purposefully aimed at equity; decentralized control of schools; and homogeneity of the population are often offered as the possible causes of the Finnish success, there are comparatively fewer studies which systematically seek to delve deeper into what makes ‘high quality, status and autonomy of teachers’ (perhaps the most significant of causes; Rautali & Alasuutari, 2007) possible. In this paper my main purpose is to attempt a summary of one specific (and, arguably, also one of the most important) part of the Finnish education system: the teacher education curriculum. I will begin by presenting some key features of the Finnish education system, and a historical background of teacher education in Finland. I will then describe the teacher education curriculum being followed presently in Finland and its key features. Finally, I will conclude with a brief commentary on some tentative ‘lessons’ that one could perhaps draw from the study, for teacher education curricula in India. Significantly, the nation was able to move beyond the usual rhetoric and implement the proposals that were mooted in the Finnish Parliament in 1967; as a result of which, ‘streaming’ of students (into academic and vocational streams) at the age of 11-12 was discontinued in favour of common comprehensive education, decision making powers were decentralised, required education for all teachers (except kindergarten) was raised to the university level and additional support for students who may need it was made a regular feature of all schools (Laukkanen, 2006). Currently, general, vocational and higher education is provided ‘free of charge’ to all citizens in Finland and adult education is also partly supported. General and vocational education is provided by local authorities and financed by both the state as well as local authorities; whereas the twenty universities – the seats of higher education (of which ten offer teacher education) – are financed by the government. The right as well as the responsibility of framing the schools’ curricula lies with the education providers – which are mostly, local municipalities and schools (as well as a few foundations who work collaboratively with them). By legislation, education providers are also required to design the curriculum in collaboration with agencies charged with the responsibilities of local health and social services, taking into account “school’s operating environment, local value choices and special resources”; and implement it in a manner to ensure not only “high standards of general education, [but also] commitment from the community as a whole to the jointly determined objectives and procedures.” (Nation Core Curriculum, 2003 & 2004). This responsibility on the teachers, as we shall see in a later section, is an important factor in shaping the teachers education curriculum in Finland. Another key characteristic of the education system is the culture of trust and co-operation at each ‘touch-point’ in the education system (national level, district, school, family) – there are no ‘inspectors’ and no ‘national exams’ except one at the end of twelve years schooling (McKinsey and Company; Hancock, 2011). Preschool/Kindergarten (6 years or below): Since 2001, access to preschools has been made a right for families; and about 96% of the age group is estimated to attend preschools. The teachers of kindergarten are required to have at least a Bachelor’s degree in education (more on this in a later section). Primary level (Grades 1-6): The responsibility of teaching the students is with ‘classroom teachers’ who must have at least a Master’s degree with specialization in education. Lower Secondary level (Grades 7-9): In this section, students are taught by ‘subject teachers’ who specialise (Master’s degree) in one or two subjects (as well as in pedagogy). All material resources, food and transport, during basic education, is provided by the state. A little less than half of the students opt for ‘vocational school’ for their 9-12 grades. The rest, choose the upper secondary schools. Upper Secondary School (Grades 10-12): Prepares students for higher (academic) education (though, switching between the two streams is fairly easy). At the end of the upper-secondary, students, take their only formal ‘exam’ – in four subjects (the others being optional) – which gives them a matriculation certificate and eligibility for higher education. All teachers at this level are subject teachers. Vocational Schools: Like upper secondary, these also accept students from comprehensive schools; and prepare them for work immediately after school. Unlike vocational schools in other countries they include a major ‘apprenticeship’ component. However, many students go on to join polytechnics for a Bachelor’s degree. The teachers of vocational schools are trained in technological universities following a specialised curriculum. Beyond school, students have the option to join universities, polytechnics, continuing education or adult education. We must briefly note here that teachers in Finnish schools can be categorised, depending on their education and job role as Kindergarten teachers, Crafts teacher, Music teacher etc. Though, each category of teachers is trained using different curriculum. In this paper, we will limit our discussion to ‘classroom’ and ‘subject’ teachers, as together they form a large majority among school teachers. Before the 1970s, while primary school teachers received their 3-year education in teacher-training colleges, secondary school teachers were first expected to receive academic discipline education for five years and then directly receive a ‘practical training’ in schools connected with universities or teacher-training colleges. A major reform – which (along with the schools reforms of late 1960s, described above) was to later prove central to the success of Finnish education – took place in 1971 with the coming out of the Teacher Education Act, as a consequence of which, the teacher education for both the newly-formed ‘comprehensive schools’ and the upper secondary schools was handed over to the universities. Faculties of Education were set up concomitantly, in every university (that existed at the time); which, in time, grew to have two departments in most universities: department of Education and department of teacher education. The former, were tasked with conducting research in general education and work on challenges in administration and planning; while the latter focussed on teacher education as well as research in teaching and teacher education (Kansanen). All teacher education for comprehensive and upper secondary schools should be academic and carried out in universities. Teacher education should be unified for different teacher categories. The initial education of future teachers must give a common and broad qualification to all teachers and this common background can then be flexibly complemented by in in-service education. Pedagogical studies should be developed in such a way that teachers are prepared to be educators in the board sense of this concept and can attend to their pupils’ socio-emotional growth. Teachers should have a pedagogical, optimistic attitude to their work that is grounded in the latest research. Theoretical and practical studies as well as subject academic matter and pedagogical studies should be more successfully integrated. Teacher education should consist of societal and educational policy studies. As we will see again in the next section, the roots of what are today the ‘hallmarks’ of Finnish teachers and education – teaching seen as an ‘academic’ career, unification and flexibility of teacher education, strong research orientation and collaborative nature – can be easily noticed in this seminal document of the mid-1970s. Following a further reform in 1979, the minimum qualification required for both comprehensive school and upper secondary school teachers was defined as a Master’s degree requiring about five years of rigorous academic and practical work. This served three main purposes : one, it unified the elementary and secondary school education by giving them both a ‘common core’ (thus, not just simplifying the training but also making ‘movement’ of teachers from one stream to other possible2; two, teachers even at the primary level were expected to meet high academic standards (and benefit from being ’academic-equals’), and three, upper secondary teachers too were now expected to train in pedagogical studies (Niemi & Jakku-Sihvonen, 2006). The next major change in teacher education came as a result of the Bologna Process (or Bologna Accords3) under which, supported by the Ministry of Education, all universities responsible for teacher education came together to form a national network (Vokke project, 2005) and collaboratively prepare new curricula for teacher education. As part of the process, teacher education in Finland changed to a two-tier degree system in August, 2005. In the next section, we will look at some of the main features of these curricula that are presently in use. Classroom Teachers: These teachers are responsible for the lower grades (1-6) of the comprehensive schools. They typically teach all subjects relevant for the class which they handle and are also responsible for the “whole personal development” of their students. As the students move up the grade, the teachers move with them. Subject Teachers: These teachers teach in the upper levels of the comprehensive school (7-9) and the upper secondary schools. They usually specialise in one or two subjects (one major and one minor) and teach only those. Before we get into a more detailed discussion of each of these categories, let us briefly look at some of the main principles that underlie the teacher curriculum design in Finland, as an understanding of these principles is helpful for understanding why the curriculum has been designed in this manner. At the very heart of Finnish teacher education lies the belief that teachers – at all levels – not only can be, but must be (turned into) autonomous professionals – experts in their fields and capable of handling various kinds of challenges (pedagogical, administrative, family or community related, even relations with local industries) on their own and in collaboration with their colleagues and local community. The development of these qualities in the average teacher, on the one hand, makes teaching one of the most sought after and prestigious professions in Finland (Sahlberg, 2010); and on the other hand, forms the basis of the trust which allows administrators and policy makers to almost completely ‘hand-over’ the task of curriculum design and assessments of students, to the teachers4. The third defining principle of the Finnish teacher education is the tight integration of theoretical aspects with practice during studies (Hytonen, 1995). The first ‘sub-principle’ under this is to allow student teachers to begin practice teaching as early as possible; while the second is to emphasize the interaction between practice and educational theory throughout the study period – in every study year (1st to 5th) and during every study period. As we had noted earlier, post the educational reforms, all teachers’ education curriculum in Finland share a ‘common core’, along with having some distinct parts. Let us consider each of the two, in sequence. The common core of the Finnish teacher education curriculum mainly consists of what are generally called ‘pedagogical studies’. These subjects, which are worth 60 ECTS (i.e. about one academic year) are obligatory (by legislation) for qualifying as a teacher; but can be taken parallely with the Master’s degree or after completing it. 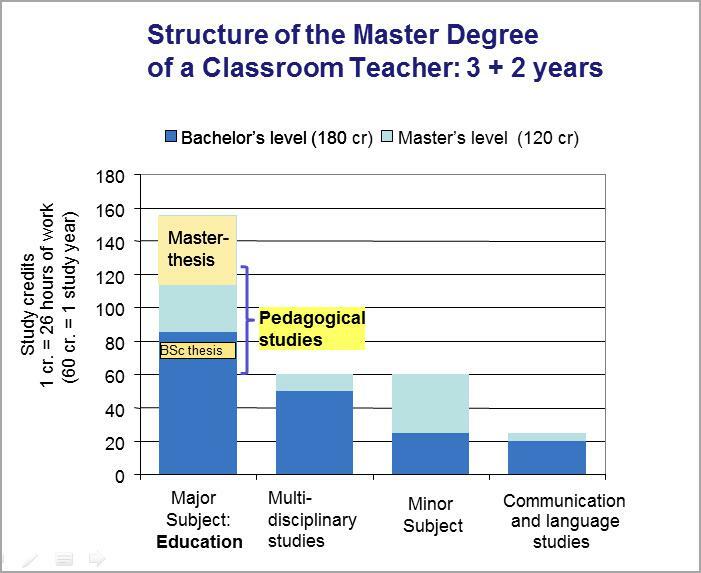 (Typically, however, for classroom teachers, pedagogical studies are spread across the course; whereas for the subject teachers it starts in or after the 3rd year). It mainly comprises of studies in the science of education with emphasis on didactics. The 60 ECTS in pedagogical studies is further distributed into theory, supervised (teaching) practice and research ‘readiness’ (with regards to the goals mentioned above). Language and communication courses are generally divided into courses in mother tongue and in foreign languages. The former includes verbal communication, speech and culture, classroom communication, didactics of speech education, written communication and academic writing skills etc. The goal of the latter is to provide enough proficiency to allow students to access foreign literature (especially research papers, books etc.) easily. Similarly, ICT studies are a regular part of the course throughout the five years, but the stress especially is on using ICT for research, teaching and collaborations. The preparation of a personal plan has been made obligatory in university studies in Finland which includes the teachers’ education programmes. Its primary purpose is to help students to plan for, seek support and finally, take control of their careers, with systematic help from their tutors. The other parts of the curricula of classroom and subjects teachers vary sufficiently, to warrant their discussion in the next section, in which we will first consider the unique courses of the classroom teacher education and thereafter, those of the subject teacher education. The main subject for study for the classroom teachers is a “systematic study of education – with emphasis on teaching, research and didactics (Kansanen).” Thus, in addition to the common subjects described above, the curriculum of classroom teacher education consists of the following three groups of subjects. Being the main course, the education studies are spread across the five years, and are divided into three hierarchical levels: general studies (or basic education which consists of “introduction to the development of educational ideas, with their philosophical, historical, and societal aspects, and with an introduction to the methodology of research, both through quantitative and qualitative approaches; Kansanen), intermediate studies (“theoretical aspects of teaching, professional development, evaluation of teaching, and the psychological assessment of pupils, research methods with a course of advanced statistics”; ibid) and advanced studies (which consists of three parts: a study project, an examination on advanced specialist literature and practice studies). The study project consists of two seminars (in the first, the topics of research, theoretical backgrounds and proposed research methods, literature survey etc. is presented; and in the second the preliminary findings and draft report is presented, which is further refined for) a Master’s Degree thesis. The course on research methods goes hand in hand with the progress of the study project. The Master’s thesis topic – an important component (which can be worth 40 ECTS) – of the classroom teachers education, is usually related to class-room topics (or general education) and are often action research. Practice studies consist of a number of internships (introductory, basic practice, field practice and finally teaching practice). The introductory and basic practice may usually be done in training schools attached with the university which has specially trained teachers who can mentor the student-teachers even as they teach their own students. The field and teaching practice is often done in municipal schools. Peer assessments and feedback and group discussions play a very important role in practice studies. Since the classroom teachers are responsible for all subjects (grades 1-6), the goal of this course is “for the students to acquire sufficient skills in the given subjects and the related basic didactic skills so as to be able to work as classroom teachers. Studies of the mother tongue and of mathematics are compulsory for all students (ibid. )” As is clear, the emphasis here is on subject didactics. In addition to majoring in education and learning about all subject didactics, the classroom teacher-students also have the option to choose one or two ‘minor’ subjects (which they wish to gain relatively more in-depth understanding of). Other than the academic subjects (maths, science etc.) they can also choose subjects such as ICT, early year education, music etc. The main difference between the curriculum of classroom and subject teachers is that the subject teachers major in the subject which they are to teach (say maths or geography as opposed to education). Students usually first apply to the subject-departments of their universities. During the second year, if they meet the stipulated criteria, they are offered the option to train as teachers. Those who opt for it, then begin their studies in education from the third year. We began with a summary of the Finnish education, noting how a stress on equity, and a consistent, concerted effort, is behind its present success; as well as some of the key features of the present education system. Then, we surveyed the historical context of the Finnish teacher education and spend some time in discussing the reforms of the late 1960s and 1970s, and their importance. Thereafter, we discussed three important principles behind the design of the Finnish teacher education curriculum and noticed how pedagogy studies, language and communication, and personal study plan, now form a common core between the classroom and subject teacher education curricula. Finally, we looked at the details of some of the unique courses and features of the two curricula. If one were to briefly attempt a comparison between the teacher education in Finland and India, one could not help notice some striking differences. The biggest difference, perhaps, is the academic requirement of the teachers – while in at least some of the Indian states (e.g. in Bihar) even non-graduates are allowed to teach in schools, Finland expects even its kindergarten teachers (equivalent, in some ways, to aanganwadi workers) to have at least a three years Bachelor’s degree (i.e. 15 years of education) in education (including a thesis). The requirements for primary and secondary teachers, similarly, are different (in practice, if not on paper) in both countries. Moreover, most of our teachers have almost no exposure to ‘pedagogical studies’ while studying for their Bachelor’s degree. Teacher’s training (putatively for a year, but often taking less than nine months) is seen as an adjunct – not the ‘central’ part of a teacher’s preparation. This contrasts sharply with the Finnish system in which pedagogical studies (which includes didactics, practicums and internships) is the ‘common core’ of all teacher education. 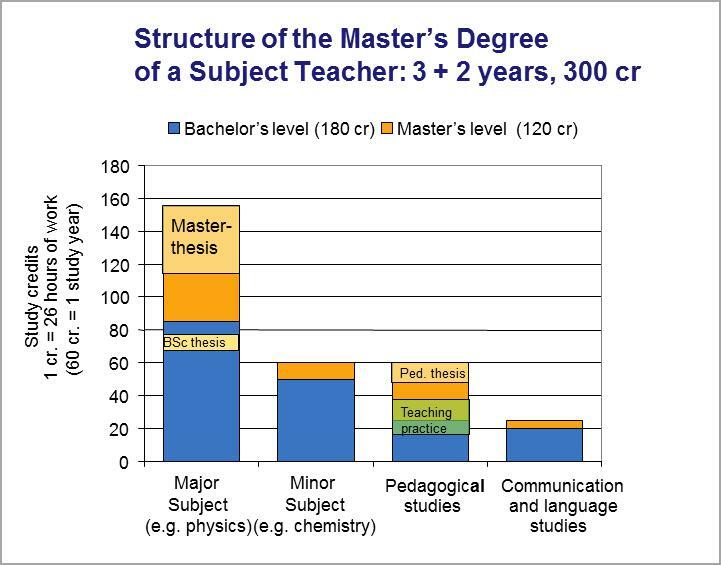 Similarly, even though comparative studies on the topic are hard to come by, one would perhaps not be surprised if Finland, with a fraction of India’s population (and number of teachers), is producing more research work (including Master’s thesis and Doctoral work) as compared to India – highlighting the lack of research orientation/training and research practice of the teachers (and resulting in educators who may find it difficult to truly ‘reflect’ on their beliefs and practices). Finally, one cannot also ignore the huge differences in the way ‘assessments’ are used; as well as the control of, and expectations from, the teachers in both countries. How many teachers or schools in India, for instance, would be allowed to – and if allowed, be able to – design their own curriculum? A poorly framed teachers curriculum (which is often even more poorly transacted in classrooms), thus, seems to lie at the heart of many of the issues being faced by the Indian education system at large. Anders, J. (2011, December 12). From finland, an intriguing school-reform model. Hancock, L. (2011, September). Why are finland’s schools successful? Dobbins, M., & Martens, K. (2012). Towards an Education Approach a la “Finlandaise”? French Education Policy after PISA. Journal Of Education Policy, 27(1), 23-43. Even leading to the birth of a new word: Finlandophilia (Anders, 2011). This common core is now shared by all teacher education curriculums – including vocational and adult.